My buddy Quint Fischer, head trainer at CrossFit Magnus in Portland, OR shot me a message the other day, asking of my opinion on certain aspects of the muscle-up. I unfortunately read this message at 3:30am. I spent the next hour blasting out a response. Giving my current thoughts and ruminations about muscle-ups and many other related facets – proper pull-ups, kipping, shoulder mobility, and more. When 4-something am rolled around, I was left with the hefty message you see below you now. I thought it too good to leave in just my outbox. I hope you can pick some useful bits out of all that I poured out on the screen. Enjoy! Alright, sit down. This may take a while. I believe to work for the hardest skill first and foremost – and that means a strict muscle-up. I mean this for both men and women. And this means getting in your false grip time. It is one of the biggest limiting factors, along with inability to stabilize the shoulders (more on that later) that keeps people from getting a muscle-up. Being able to do a strict muscle-up shows excellent stability in the shoulder, as well as forearm strength. It’s not even a skill in gymnastics – it’s how you get on the rings! If you want to be good at gymnastics, learn a strict muscle-up. It’s like wanting to be a racecar driver, but being unable to get inside your car. Let’s expect more from ourselves people, seriously. That’s not to say a strict muscle-up is easy for the general gym member these days. Many are so ingrained with terrible motor patterns – in this case specifically, the inability to stabilize the shoulder. Just like people’s shoulders shrug up to their ears to stabilize in a crappy pushup, so too will people’s shoulders move when they are looking to stabilize in a crappy pull-up or failed muscle-up. People also don’t know what to feel/look for in the skill – that’s where our impeccable coaching comes into play. So for a failed muscle-up, rather than muscles like the lower traps and serratus anterior keeping the scap down and in place, everything rises up. If your shoulders rise up, then your body ultimately goes down, and you fail to get the necessary height for a strict muscle-up . . . or a proper pull-up even. Which is why I’ll have people test themselves on a strict, chest to bar pull-up. Most athletes don’t even understand what that means. I always reference that pic of Franco Columbu doing a pull-up. Chest to bar (presumably), and knees/feet back. If the knees start to come forward and the body starts to curl up during a chin-up/pull-up, then the shoulders/scap have failed to stabilize fully, and you’ll tend to see people eek their chins over only, and their shoulders are rounded forward – far from getting their chest to the bar, and far from a strict muscle-up. How can you expect to get over the rings/bar, if you can’t even get TO them? On a side note, I’ve also been thinking about how simply working pull-ups in this manner might not be enough to properly stabilize the shoulders. It will get you a muscle-up, but the lats may need some mobilization and the lower traps need additional attention. Read this article from Cressey about pullups, specifically pay attention to the “gross extension pattern” and the #2 point – that the lats overpower the lower traps. I believe I have been guilty of this for years, and it was manifesting itself in my one arm handstand work – I was having a very difficult time getting full overhead range of motion! Instead of having lower traps strong enough to properly upwardly rotate my scapula and give me the shoulder range of motion and stability I needed, I was getting stuck at less than 180 degrees of flexion (i’m still not quite there, but definitely improving), and my one armer was suffering as a result. The band really engages the posterior delt. Proper cues on this are to keep the upper traps relaxed, abs braced, ribs down, and head/neck not cranked forward – the same alignment as an efficient handstand! I’ve also been playing around with Mike Reinhold’s take on the ytwl, specifically the need to relax the neck when doing these scapular stability exercises. He makes a good point that tight neck (as when laying face down on an incline bench, or jutting the head forward on the wall slides) will cause problems when looking to properly recruit the lower traps. He also mentions lumber hyperextension as a compensation pattern, which in my mind references back to Cressey’s idea of a gross extension pattern that is a sign of lower trap weakness. Getting a proper pull-up and additional lower trap/serratus work is the base work. Now, I understand that CrossFitters need to do 1,000 muscle-ups in a row, so I definitely understand the need for a leg-assisted muscle-up in the repertoire. I say “leg-assist”, because I don’t like to throw around the word “kip”, unless I mean it. Continue to work toward a strict muscle-up, but hear me out on the leg-assisted techniques. In the case of a kipping pull-up, power is gained from explosively extending the hips. This gives a lot of power, but I do not believe it is the most efficient method for a leg-assisted muscle-up on the rings. Now in order to get to a dip, they have to violently throw themselves forward. Maybe not the best to ask the athlete to repeatedly brace themselves like that? But it definitely seems like an inefficient movement to me – why do we lean our body all the way back, just to go forward again? What I like instead is a swing from the legs that keep the torso much more upright. Think of hanging from the rings (shoulder engaged and stabilized, of course), and then swinging the straight legs up like you’re about to go into an L-sit pull-up. What this does is gives us lift (from the legs swinging), while keeping the body upright. 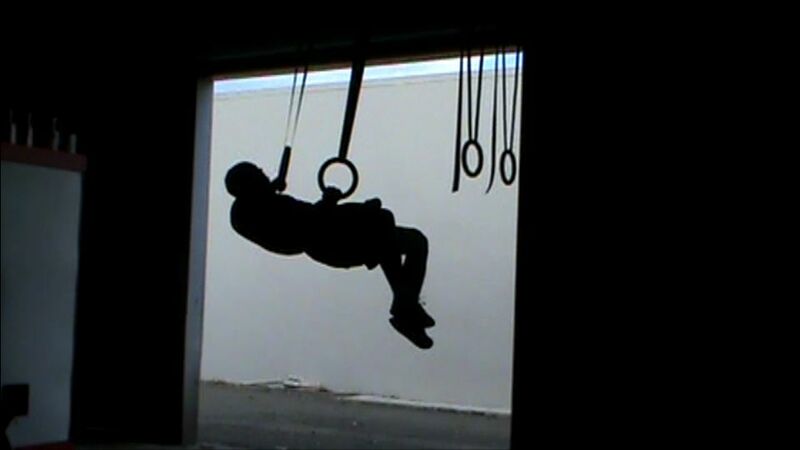 The athlete then only has to lean forward and over the rings at the top a small amount in order to arrive in their dip, rather than the long and violent journey of a traditional kipping muscle-up. These are not pie in the sky theories. I’ve applied this technique to many, many CrossFitters who were stuck below the rings. I have seen many of these CrossFitters get their first muscle-up right before my eyes with this new technique. I don’t know if it’s the best or only way to do things, but it’s got legs. This technique also carries over quite well to bar muscle-ups, and if you think, you can understand why the traditional kipping muscle-up technique would fail. If we kip and put our hips up super high, we will smash into the bar. The rings allow this because there is nothing stopping the hips, but the bar does not. Keeping ourselves upright instead, and swinging the legs, will allow the body to rise behind the bar, and the allow you to flip over top the bar to complete the muscle-up – just like climbing up and leaning over top of a wall. 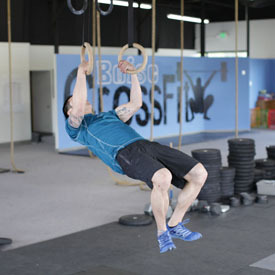 – which as you know, can wreak havoc on inflexible shoulders, we keep more of a hollow body position on the rings and bar. So with an inability to properly stabilize the shoulder, lack of grip/forearm strength, dominance of the lats/upper traps over the lower traps, and kipping hard into weak/stiff shoulders, is it any wonder why we see injuries and lack of results in our gymnastics? Would love to hear your experiences/feedback. Hope you’re doing well too, I’m long overdue for a visit! Great read, as always! Would love to see pictures or videos of you doing what you have described! Google around for what you can. I am swamped away from la computadora, so videos will be very slow coming. Love KStar’s stuff. I pull from many resources. Been meaning to thank you for the response! Great stuff. Big believer in Cressey and Reinold’s shoulder stuff. Thanks for sharing this thorough article about the interesting world of muscle-ups. This year one of my fitness goals is to be able to do at least one strict muscle-up so I will certainly use your advice and knowledge to succeed. Juan. The muscle-up is well within the reach of anyone willing to put the hard work in. Good luck! Awesome article! Although now I feel a bit concerned of whether I should be doing any other exercises to balance my pullups (which I’m really weak at though 6-7 reps max), so that I don’t do any of the bad stuff mentioned above. I don’t yet understand enough about how the skeleton and muscles work together to understand everything you’ve said above, but I do know that I’ll have to get to that point by the time I start doing one handed pullups. Is there a similar point on this when it comes to pushups? I’m at a much more advanced stage with them, and so somewhat more concerned. I’ve got to do some reading on the human body! Continue to read, continue to get your workouts in regularly. Do face pulls. Agreed man. You need to be able to control the shoulder (strict reps), before you go flying into things (kipping). Also, the lats are important, but also the lower traps for stabilizing the scapula. Great article. The muscle-up technique you’re describing sounds a lot more like a bar muscle up (where you stay more perpendicular/upright). I haven’t tried this on the rings yet, but now I’m looking forward to! That is absolutely correct, and another reason why I teach the ring muscle-up that way. Good read, you offer some handy tips. I’ve been working on pullups and muscle ups this year and this helped. Man, Franco Columbo was such a beast! The way him and Arnold used to workout together is inspiring. They both did tons of drugs, I’m sure – but they both worked really, really hard!!! Huge thanks. 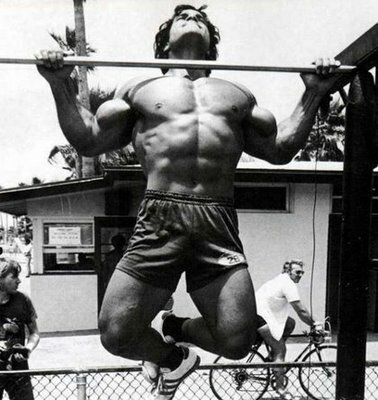 This is one of the best articles on pull ups, muscle ups and why not to kip! We really appreciate all the great knowledge and inspiration! Big ups!!! I agree with all the other comments…this is a great article, very informative and a technique i’m going to apply when i do ring and bar muscle-ups. i’m a crossfitter and just managed to get my bar and ring muscle-ups about a month ago (leg-assisted muscle-ups….I love that way of looking at it!). i do feel my muscle-ups are a little awkward and the difficult part for me is that mid-point between pull-up and dip transition. but your commentary on the ‘stable shoulders,false-grip and vertical body movement’ seem to be key factors which i will apply and then i’m confident i’ll get efficient technique right….and better muscle-ups. my aim is to get consecutive strict muscle-ups( x 5, then 10) within a month or so…. a friend recommended this site to me and this is the first article i read and i am confidently a ‘loyal follower’. my next goal – one handed hand-stand… Thanks for the good advice. Glad you like the article and good luck with your training!